Dequervains disease causes wrist pain centered on the thumb side of the wrist. It is a common condition caused by swelling of the tendons as they pass through a tight tunnel at the level of the wrist. This swelling leads to the tendons rubbing as you try to move the thumb and wrist, which causes pain and discomfort. DeQuervain’s disease can be associated with many conditions. 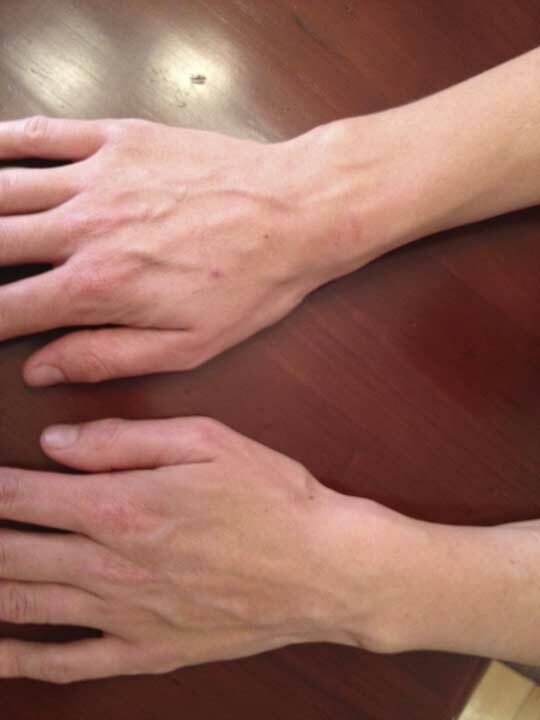 Anything that leads to swelling at the wrist can cause Dequervain’s. Common associations are with repetitive lifting (such as a new mother lifting a baby), pregnancy, diabetes, osteoarthritis and rheumatoid arthritis. Rarely it can be associated with ganglions or tumors in the tendon sheath. A simple examination is usually enough to confirm the diagnosis of Dequervain’s disease. Swelling and discomfort in the area over the correct tendons helps to confirm the diagnosis. Bending the thumb inside the other fingers when making a fist and pushing the wrist down usually reproduces the pain and also helps confirm the diagnosis. This maneuver is known as “Finklestein’s” test. If the diagnosis is unclear or your symptoms are different to the usual your surgeon may order an ultrasound to look for deep swelling or other reasons to explain your discomfort. In the early phases of the disease simple measures may be enough to relieve your symptoms. Avoidance of heavy lifting and actions that reproduce the pain can allow enough time for the swelling to reduce and the pain to go away. Similarly using over the counter anti-inflammatory medications can provide some relief. If these measures fail then assistance from a hand therapist who can provide splints and advice about hand usage can be of use. If these more simple measures are not successful then further measures can be taken. An injection of steroids around the swollen tendons as they pass under the tight space at the wrist can be very successful especially in cases diagnosed early. The space into which the steroids need to be injected can be divided into several smaller compartments so this injection should be performed by a specialist or under ultrasound guidance to ensure success with pain relief. If your symptoms are severe or have been present for a long time you may require surgery. Surgery for DeQuervain’s disease is done as day surgery usually under a light “sedation” so that you are unaware of the surgery being performed. The surgery involves making an incision over the affected area and releasing the tight ligament over the tendons to free their movement. Recovery after surgery is usually quite quick and light activities involving the operated hand can be started the day after surgery.